Home Beers Miller Brewing Co.
Miller Genuine Draft | Miller Brewing Co.
Miller Genuine Draft delivers a fresh from the tap taste through its proprietary "cold-filtered four times" brewing process. Introduced nationally in 1986, Miller Genuine Draft was born as the original cold-filtered packaged draft beer. Today, Miller Genuine Draft is reinforcing its status as the best draft beer in a bottle. 24 ounce can into lager glass, best before 6/11/2018. Pours crystal clear medium golden yellow color with a 1 finger fairly dense and rocky white head with awesome retention, that reduces to a nice cap that lingers. Nice spotty soapy lacing clings on the glass, with a fair amount of streaming carbonation. Fantastic appearance. Aromas of cracker, corn, white bread dough, lightly toasted biscuit, light nuttiness/pepper, and herbal/grassy earthiness. Touch of fruity aromas, but not overwhelming. Nice and pleasant aromas with pale malt/corn and light-moderate earthy hop notes; with solid strength. Taste of cracker, corn, white bread dough, lightly toasted biscuit, light nuttiness/pepper, and herbal/grassy earthiness. Light-moderate herbal, grassy, peppery bitterness on the finish. Lingering notes of cracker, corn, white bread dough, lightly toasted biscuit, light nuttiness/pepper, and herbal/grassy earthiness on the finish for a good bit. Very nice robustness and balance of pale malt/corn and light-moderate earthy hop flavors; with a great malt/bitterness balance, and zero cloying/astringent flavors after the finish. Moderately crisp/clean finishing. Perfectly clean on lager flavors, with zero yeast notes present. Light-moderate increasing dryness from lingering bitterness and carbonation. Medium-high carbonation and medium body; with a very smooth, moderately bready/grainy, and fairly sticky balanced mouthfeel that is great. Zero warming alcohol as expected of 4.7%. Overall this is a very good pale adjunct lager style. All around nice robustness and balance of pale malt/corn and light-moderate earthy hop flavors; very smooth, crisp, clean, and refreshing to drink. Very flavorful and never watery for the ABV. Perfectly clean pale malt/grain flavors, and nice earthy hop presence for the style. Not overdone on adjuncts at all, plenty of barley presence. A very enjoyable offering, and well made style example. Best macro adjunct lager I have tried so far. O my Lord. How do you really rate the beer of yer indigent youth without bias. This was my default, O my brothers. My go-to, my backup. Others have Pabst, others have Rolling Rock, others have Yuengling, but mine was MGD. I have had too many good times on the back end of an MGD to rate it any lower than a 2, but too much presence of mind to rate it any higher. This is swill. There's no two ways about it. But, O my brothers, in the early to mid 1990s, it had the moniker "genuine", which was enough to sell it to a dork like me. One night, one glorious night in the relative innocence of the 1990s I got picked up in a bar in Wisconsin after having ten of these by a VERY pretty girl, despite being myself utterly average in every regard, with no effort whatsoever expended on my part, and for that reason, MGD always has a home in my home when push comes to shove. But it's really awful beer, truth to be told. I wouldn't buy this on purpose in a scenario short of the zombie apocalypse. This is the cold filtered, unpasteurized version of High Life. It is a beautiful lager. Color, clarity, and head are all spot on. Head fades a little too quickly from the adjunct. Top quality taste for a high adjunct, pale, American-style lager. The fact that this is not pasteurized is huge. The heat from pasteurization really diminishes the flavor of beer. Drink this side by side with a High Life and taste the difference. It is the same beer! MGD is malty and grainy, but with minimal astringency. The body is smooth but also somewhat rich and satisfying. Bitter, lemony, mild hops linger. Yes there is some corn / grain. But the beer tastes good and fresh and mild. Mouthfeel is perfect for the style. Overall pretty damn good and way underrated. HEY!! I just realized I've never given this beer a proper review! MGD pours a bronze-gold color (or horse pee, whichever is more eloquent to you); distorted slightly by the violent migration of tiny bubbles to the top like a champagne. The head is stable, very stable, and sticks around at a creamy pinky finger's height. I'm actually very impressed at the head retention on this mass produced lager. It leaves lace, too. Aroma is perfumey, but only slightly, with hints of orange pith, banana, dried corn, pool shock, and hay. Flavor is purely chemical to start, then the fruity esters arrive with banana and blueberry; sweet corn, bready pilsner malts, and finally a grassy, bready finish. Feel is the best part. It's so quenching, so carbonated, and leaves a slightly resinous feel on the teeth. I like it. Overall, it's a pretty solid AAL, and if you can't find Pabst, Old Style, or Rolling Rock, this will do the trick nicely and when you're all done, the glass smells like bread. For what it is, not bad. Very crisp and malty, what a beer should be for commercial macros. One of only a few macro brews I wouldn't mind seeking out again from time to time. Best drunk from a can or poured from can to glass. Bottle of this though is horrible. I give this high rating because when it comes to MGD you have to compare it with other similar beers such as Budweiser, Heineken, Stella, Labatt Blue and so on. You shouldn't compare it to IPA's or stouts or ales but rather similar commercial beers and for me MGD gets a 5 because it's the most delicious. It is fraught canned and when you poke the tab as it suggests and pour it into a pint glass it just tastes very smooth with a creamy head and very crisp. If i tailgate this is my beer of choice. Although haven't had this beer since Budweiser took over so next time I have it my opinion might change. Drank ice cold straight from the bottle. This beer is getting a little tough to find in my neck of the woods, I guess it's just not very popular in the NY Metro Area. If you don't expect much from this beer you won't be disappointed. It basically is what it is, a good thirst quencher for a hot summer day. Better then just about it the big Macro Brewery. I'll take an MGD or High Life over anything by Bud or Coors any day of the week. Gold colored beer with a rapidly fading head. ...pretty good beer in my opinion...I know this is not a favorite beer style on this site but I will always be a fan of macros. Guess the way to properly rate this beer is out of the 40 oz it comes in. Smell is slightly stale and a similar sweet light maltiness to high life. Taste is strong given the low abv. Very malty. Still one of my favorite brews from Miller, beats the pants off of Miller Lite. This is a sweet filtered lager that finishes very smooth and does not have a lot of complexity, which is a welcome change any time of the year. My favorite beer of all. Always smooth and refreshing. Easy to drink. I love this beer and always have some in the fridge. The cold filtered taste is amazing. Cheers. Picked up a fresh six-pack to drink like the locals while in Milwaukee for the 2017 U.S. Open. Tastes just as I remembered from my college days. The colder the better. The fresher the better. Drank right from the bottle. A good beer that I'll choose over Bud every single time. #MGD. Pour: lightly hazy straw color, frothy two inch thick head with good lacing. Nose: cereal grains, fresh wheat, taffy. Taste: incredibly balanced flavor of light corn and cereal grain. No off tastes like bitterness or strange sweetness. Very smooth flavour profile all the way to the finish. Exactly what I would want a cheap american beer to taste like. Not watered down at all a nice golden malty and grainy flavor that doesnt get boring after the first sip like some others. Guys I really think you’re being to hard on this one. Im currently in a place where im strapped for cash so i have had to resort to chraper beets for the time being. Been trying different things but always come back to MGD. This beer is nothing special and does beling on the bottom shelf with PBR and Bud but it’s the best of the bottom shelf. It’s the perfect 40oz and great if you’re buying a 30 pack. Is it a great beer in the grand scheme of things? No but I’m giving it a 4 because I’m not comparing it to high quality beers. In the line of beers it competes with it is a very good beer. Not as terrible as I expected. Same one-dimensional taste for macro-lager, with only a little skunk. Would be tolerable to drink cold on a hot day. Basic. Golden in appearance with decent head retention and lacing. The nose is grainy without hops; and as much alcohol as could normally be detected. Basically a "generic" beer aroma. It's crisp in the mouth with a median carbonation and moderate body. The grainy maltiness of the nose is present in the flavor along with a corn-like flavor. It's not sweet, but it's just barely balanced, leaving it lacking. Still, it's clean and dry. Basic. These kind of beers (bud lite, coors lite, corona etc.) can't be rated on the same scale as badass IPAs and the like. It's apples to oranges and these should be rated based on what they're supposed to be. One isn't meant to sit down and savor the taste of a can of MGD. It's a casual drink for a hot day to go down quickly, smoothly and lightly (which it does). Having a summer pool party with the friends? I'll take this over a stout any day. Winter night after work and want to watch a movie or read a book? I'll take a Ballast Point stout. Nice and fizzy, not much of any initial taste but goes down nicely with a bready and sweet corn aftertaste. It's quite light and is great for any hot day barbecue. I really don't understand the bad reviews. This beer is a notch up from High Life, and nothing beats it on a hot summer day. Excellent, honest lager. I always drank Miller High Life & it wasn't until recently that I started buying MGD. I always thought of it as an old man's beer. Then I found out that it was the same ingredients as High Life, just cold filtered instead of pasteurized, to help give it the draft beer taste. I see a lot of negative reviews but don't really understand them. Yes I know it's not a "craft beer" but I would recommend that you give it a try for yourself rather then read silly reviews. First thing's first,i basically grew up with this beer and it followed me all through high school.Thanks to my grandpa and dad for that.When i'm not in the mood for a higher priced great craft brew i find myself buying this beer often...can only.It is your typical big brew beer...rice,little malt smell,etc. This beer for me is great on a warm day out at the lake cooking out and relaxing and thats about it. I'm sure my childern will pick up on this beer too,after sneaking some from the fridge,and feel the same way i do abuot it. 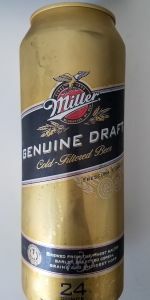 I purchased a can of Miller Genuine Draft for $1.99 USD in Glendale, CA/USA. Look: Miller Genuine Draft had a vague light yellow liquid appearance. Slight amounts of bubbles. Smell: Miller Genuine Draft had a vague aroma of nothing with light airs of fermented grains. Taste: Miller Genuine Draft had a light flavour of water mixed with grain and hints of vague bitterness. Feel: Miller Genuine Draft had ordinary carbonation. After the can of Miller Genuine Draft was finished, there was a sensation that time had disappeared by drinking a bland beer. Overall: People who desire an unbearable feeling of bland sensation will seek Miller Genuine Draft as a confusing compensation. 473 ml can served cold, in a pint glass. Purchased from the beer store for $2.15 CDN. In my mind this has long been one of my more enjoyed adjunct lagers, although doing a full review I'm curious to see how it stands up. Appearance - crystal clear sparkling gold color. Capped by over a finger of white head that had respectable retention time. Lots of bubbles make a quick ascent to the surface. Even some lacing left behind. Smell - a faint corn sweetness, some straw and other grains and not much else. Unimpressive. Taste - some adjunct sweetness in the middle, faint bit of well chewed bubblegum. Very clean tasting. The sweetness breaks away into nothing to prevent any cloying flavours. It's not really that bad. Mouthfeel - smooth and crisp, albeit a little on the thin side. Somewhat dry finish. Overall - not as bad as some people say, I'd rather have this than Bud or Coors and probably even Molson Canadian. Highly drinkable and easy to put a few away. I think this beer is one of the best mass produced easily available in North America around. Cold clean and crisp a real thirst quencher on a hot summer day. It gets a bad rap from beer snobs but it's definitely one of my go to beers. I have never in my beer-swilling life ever had an MGD before. Wow. I've seen it plenty of times - acquaintances of acquaintances bringing it to parties, etc., but I can't recall ever cracking open one of those clear bottles. First time for everything, I suppose, now at the oft-changing bar across the street from my abode. This 355ml bottle pours a clear, pale golden yellow colour, with one finger of fizzy, weakly bubbly dirty white head, which leaves a little soap scum lace around the glass as it quickly falls away. It smells mildly of doughy, corny pale malt, a bit of soft yeast, and lightly skunky leafy, earthy hops. The taste is big on that mealy corn sweetness, uncooked, yeasty bread, and kind of grassy (the crab variety), um, hops, I suppose. Not a lot of the expected skunk comes through, small miracles indeed. The carbonation is fairly sedate, and unobtrusive, the body definitely on the light side, weight-wise, and smooth, sure, in a tongue-scraping, clammy manner. It finishes mostly sweet, the corn cereal malt duly persisting, with only a mildly skunky taint in offset. For some reason, possibly due to my surroundings and distractions, this went down fairly well, lack of overt off-flavours and all. So, I guess the lesson here is: don't pay too much attention, and you can drink this, even enjoyably! Sums up the typical BMC marketing ethos, I'd say. Miller Genuine Draft from Miller Brewing Co.